Die Hard Arcade, known as Dynamite Deka (ダイナマイト刑事) in Japan, is a 3D arcade beat-em up developed by Sega AM1 and Sega Technical Institute. It was published by Sega for the Sega Titan Video arcade platform in 1996 and for the Sega Saturn in the following year. Die Hard Arcade has players save the president's daughter from a group of terrorists led by Wolf Hongo, who have taken over a skyscraper. It is a one or two player game, player one taking control of Bruno "Mister Dynamite" Delinger (Die Hard protagonist John McClane in the overseas versions), and player two controlling Cindy Holiday (renamed to Kris Thompsen in the overseas Saturn versions' instruction manual). Similar in many respects to Virtua Fighter, Die Hard Arcade is a 3D beat-'em-up, although action mostly takes place on a 2D (or "2.5D") plane, similar to older Sega releases such as Golden Axe and Streets of Rage. Die Hard Arcade, however, puts a greater emphasis on the use of weapons and objects which can be found on the ground, and levels are interspred with quick time events, which if completed successfully, can save the player the trouble of having to fight more opponents. Dynamite Deka was designed to be a 3D beat-'em-up game inspired by the movie Die Hard (which in turn was inspired by a 1979 novel, Nothing Lasts Forever). 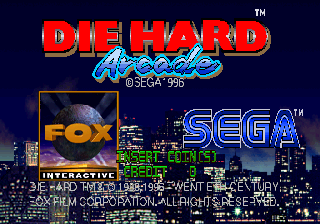 In overseas markets, it was granted official use of the Die Hard license by Fox Interactive - a move which occurred very late in the game's development cycle (and hence does not feature in Japanese versions). It was the last title to credit Sega Technical Institute before the team was dissolved. When released on the Sega Saturn, the game came bundled with a version of Sega's 1979 arcade game Deep Scan. Each 200 points earned in Deep Scan gives the player credits in Die Hard Arcade. Dynamite Deka was followed by Dynamite Deka 2 on the Dreamcast/Sega Model 2. This game was known as Dynamite Cop outside of Japan. The story would be continued in Dynamite Deka EX, also known as Asian Dynamite, and the game would be remade in the form of Sega Ages 2500 Series Vol. 26: Dynamite Deka. Package Design: Moore & Price Design Group, Inc.
Main article: Die Hard Arcade/Magazine articles.